Taxis are everywhere in Tokyo and they're very easy to catch. It can be convenient to take a taxi in Tokyo, especially when traveling with children or luggage, but be warned that they are pretty expensive. Tokyo taxis are quite expensive, especially in comparison to Kyoto or foreign cities. It's very easy to catch a taxi in Tokyo. Tokyo taxi drivers are honest and safe. There is no need to tip a taxi driver in Tokyo. You can wait in a taxi rank outside a train or bus station, but it's often easiest to flag a taxi off the street. Just try to choose a place where the taxi can stop easily. At night, it's easy to spot an open taxi: the light on the roof will be illuminated. In the daytime, it can be harder to tell if a taxi is open. Look for people inside the car and the light in the lower left corner of the windshield. If it is free, the light will say: 空車 . If it is full, it will say: 賃走中 . It helps to smile and say "Ohayo gozaimasu," "Konnichi wa," or "Konbanwa" when you board (good morning, hello or good evening, respectively). This will set the driver at ease. Most drivers know enough English to understand where you want to go, but it always helps to have someone write your destination in Japanese. If you're returning to your hotel, just hand the driver the business card from your hotel. The driver will always turn on the meter and you do not have to worry about "being taken for a ride." The meter will show the fare. Most taxis cost Y730 for the first 2km. Thereafter, the fare rises Y90 for each 280 meters traveled. The fare also rises when the taxi is stuck in traffic. 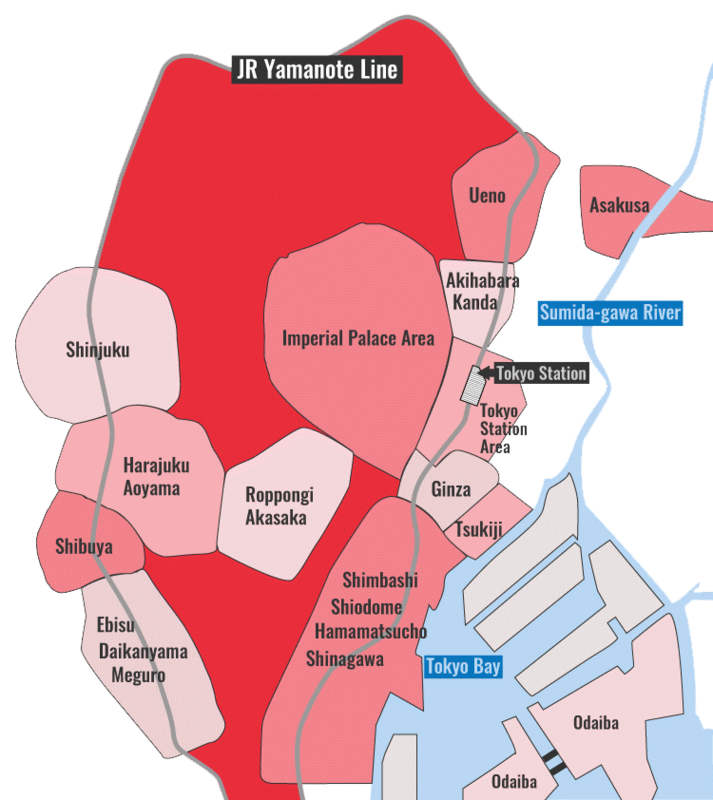 As a general rule, it will cost around Y3,500 to cross Tokyo in a taxi (for example, from Tokyo Station to Shinjuku Station). How many people can fit inside a Tokyo taxi? 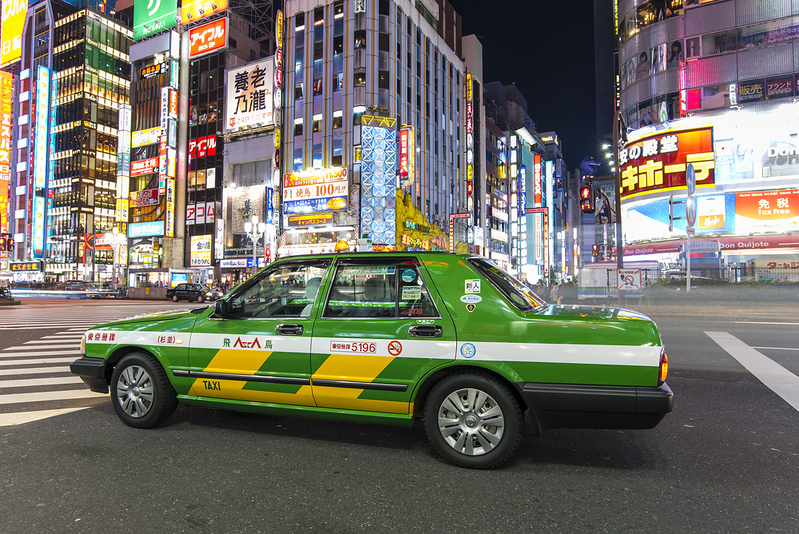 Tokyo taxis come in three sizes: kogata (small: 小型 ), chugata (medium size: 中型 ), and ogata (large size: 大型　). At some taxi ranks, like the ones at bigger train stations, there are different lines for each size taxis. Four people can fit into a kogata (small) taxi, while five people can fit into a chugata (medium) or ogata (large) taxi. Note, however, that some taxi drivers will refuse to allow five large foreigners into their taxi. In this case, you'll have to take two different taxis. Note also that if the taxi in question lacks a bench seat in front, it will only be able to take four people, no matter how large the car is. Tokyo taxis have satellite navigation systems that can use phone numbers or addresses to search for places. Bring the business card of your intended destination, or have someone at your hotel write the name, phone or address of your destination. Or, print it out from a computer or just show your smartphone to the driver. Your driver will appreciate this and you'll have no language issues. For information on taking a taxi to/from Narita or Haneda airports, see my Tokyo Airport Transport page.